To people who are skeptical about the need for DACA, I would tell them that I know I am not a U.S citizen, and I do not have the same rights as a citizen, but I love this country as if I was a citizen. This country has become my home. I have grown up here, I have Americanized myself to be a part of everything around me. DACA, and other efforts for DREAMers, are essential to help the people who really want to give back to the U.S.A. by giving them a way to make our sure hard work contributes to our country’s prosperity. I was seven years old when we arrived in the United States, and I have lived here ever since. Like every kid that immigrates to the U.S., I was overwhelmed with all the new things coming my way. At seven years old, my whole world changed. I remember being clueless about the new language, and my first few months here I really struggled with my reading and spelling. In Spanish, everything is mostly written or read as it sounds or looks, but English is a different story. As the new kid who struggled with English, I was bullied my first two years in school.Even with the adjustment issues, my childhood was easy compared to my parents’. They were born and raised in a small town in Jalisco, Mexico. They needed to help support their families and raise their siblings, so neither one of them was able to finish grade school. Today, my dad works at a farm where he cares for the horses and maintains the land. We are lucky. My dad’s bosses and their children have practically become family. Even with the cultural difference, they always do their best to understand us and to make us feel at home. My mom cleans houses, but still finds time to be very involved with our activities. My parents have sacrificed everything to get us to where we are right now. Without their willingness to support us, I personally would not be attending college this fall— I’m a first-generation college student! Because of them, I have learned to work hard for the things I want in life. I knew from the beginning that I was not born here. I think that as I got older, I began to fully understand what being undocumented really meant. Like most kids, middle school and high school were years of change for me. I always kept my Hispanic roots with me, but I also made the American culture a part of my life. Most of my friends have always been Americans. As we all got older, race, social standings, and legal status did not matter. My friends and I have developed a special bond because we looked past everything else and only focus on encouraging each other. During high school, I lost my fear of what others would think about me, and I developed new friendships. I was involved in organizations, volunteering, and tutoring. Growing up, many of my teachers pushed me to do my best. My parents were supportive of every club and idea I pursued. I have learned, from my Godparents, that no matter what life throws at you, you can always get through it. Even though I experienced some tough moments, my overall experience growing up in America was great. When I received DACA status in 2015, I was able to get my license and obtain car insurance. I have also been able to get a good job, and most importantly, I have been able to attend college. DACA has benefitted my life tremendously. After graduation, I plan to give back to my community by translating at Parent-Teacher conferences and any other events organized by the local schools and community. I also plan to speak to undocumented high school and middle school students about the importance of being involved in school and obtaining good grades. I want to let them know that even though there is no federal money offered to us for college, that there are still ways to attend. I want to give them and their families hope. 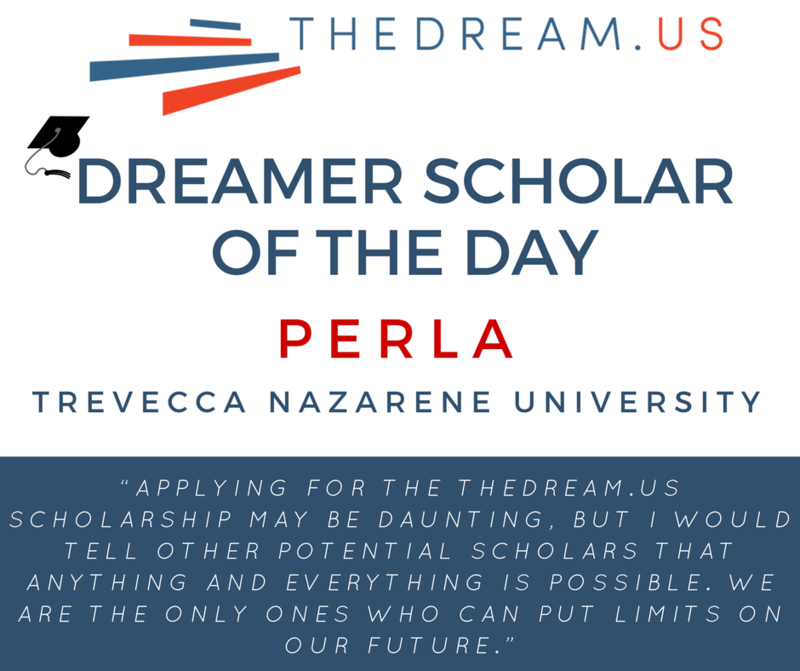 Applying for the TheDream.US scholarship may be daunting, but I would tell other potential scholars that anything and everything is possible. We are the only ones who can put limits on our future. We can do anything if we really set our minds to it. There will be rough times and everything will take patience, but if you work hard it will all be worth it in the end.Higher education access for DREAMers is important because it allows us to break away from stereotypes. It truly shows that we want to educate ourselves so that we can help the country we call home continue to grow and prosper.